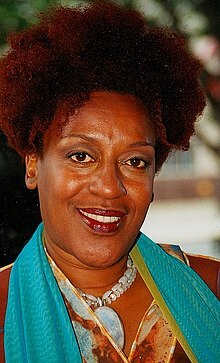 Carol Christine Hilaria Pounder (born December 25, 1952), known professionally as CCH Pounder, is a Guyanese American actress who has appeared in numerous plays, films, made-for-television films and television miniseries and has made guest appearances on notable television shows. From 1994 to 1997, she played Dr. Angela Hicks in the medical drama ER. From 2002 to 2008, she starred as Detective Claudette Wyms in the FX police drama The Shield. In 2009, she appeared as Mo'at in James Cameron's film Avatar. She starred in recurring roles as Mrs. Irene Frederic on the series Warehouse 13 and DA Thyne Patterson on the FX series Sons of Anarchy. Since 2014,[update] she has portrayed medical examiner Dr. Loretta Wade on NCIS: New Orleans. Pounder was born in Georgetown, British Guiana (now Guyana), daughter of Ronald Urlington Pounder and of Betsy Enid Arnella (née James). She was educated in England and moved to the U.S. in 1970, where she attended Ithaca College. Pounder made her acting debut in the film All That Jazz (1979). Pounder started her professional career in New York City theater, where she appeared in The Mighty Gents, by playwright Richard Wesley, and Open Admissions on Broadway. She moved to Los Angeles in 1982. Pounder starred in the film Bagdad Café, and has made smaller appearances in many other successful films. She has focused primarily on her television career. In the early 1980s, Pounder first appeared in guest roles on Hill Street Blues, and then on several popular shows (The Cosby Show, RoboCop 3, L.A. Law, The X-Files, Living Single, and Quantum Leap) before landing a long-running recurring role as Dr. Angela Hicks on ER, from 1994 to 1997. In the midst of this she co-starred in the Tales From the Crypt feature film Demon Knight (1995). She then returned to guest appearances on other shows, including The Practice, Law & Order: Special Victims Unit, Millennium, The West Wing (where she was considered for the role of C. J. Cregg), and the short-lived sitcom Women in Prison. From 2002 to 2008, she starred as Detective Claudette Wyms in the FX police drama The Shield. For this role she was nominated for the Primetime Emmy Award for Outstanding Supporting Actress in a Drama Series in 2005 and an NAACP Image Award. She had previously been nominated for an Emmy in 1995 (for guest starring in The X-Files) and in 1997 (for her supporting role on ER). She has also lent her voice to several video games and animated projects, including Aladdin and the King of Thieves, True Crime: Streets of LA, Gargoyles as Desdemona and Coldfire, and most recently Justice League Unlimited as government agent Amanda Waller, a role she reprised for the animated movie adaption of the comic book Superman/Batman: Public Enemies as well as the video game Batman: Arkham Origins, its companion/sequel Batman: Arkham Origins Blackgate, and another animated film that takes place in continuity with the games, Batman: Assault on Arkham. Also, Pounder was one of the readers for the HBO film Unchained Memories: Readings from the Slave Narrative (2003), directed by Ed Bell and Thomas Lennon. She appeared on the Syfy series Warehouse 13 until its finale on May 19, 2014. Pounder also was one of the stars of Fox's cancelled 2009 sitcom Brothers. Pounder was nominated for the Emmy Award for Outstanding Guest Actress in a Drama Series for her appearance in the BBC/HBO series The No. 1 Ladies' Detective Agency. She co-starred in The Mortal Instruments: City of Bones (2013). In Disney's "The Lion Guard" she voices Kongwe, the wise old Turtle. In October 2018 she made an appearance in the London production of Wicked. CCH Pounder and Glenn Close at the Peabody Awards 2006. 1981–1986 Hill Street Blues Jasmine, Wilna Tucker, Ms. Jones Episodes: "The Second Oldest Profession", "Little Boil Blue", "Amazing Grace"
Valerie Mrs. Davis Episode: "Full Moon"
Cagney & Lacey Timmons Episode: "Disenfranchised"
1989 227 Lucinda Markle Episode: "Babes in the Woods"
Miami Vice Yvonne Episode: "Too Much, Too Late"
Quantum Leap Mama Harper Episode: "Black on White on Fire"
Frasier Dr. McCaskill Episode: "Dark Side of the Moon"
1991 Lifestories Roxanne Tevis Episode: "Darryl Devis"
1992 The Cosby Show Clair's friend Episode: "Clair's Reunion"
The X-Files Agent Lucy Kazdin Episode 2.5: "Duane Barry"
1995 Living Single Nina Shaw Episode: "Mommy Not Dearest"
1998 Histeria! Harriet Tubman (voice) Episode: "General Sherman's Campsite"
1999 Batman Beyond Anchor Woman / Passenger (voice) Episode: "Rebirth"
2000 The West Wing Deborah O'Leary Episode: "Celestial Navigation"
The Outer Limits Stranger Episode 6.13: "Decompression"
2001 The Practice Elaine Washington Episodes: "The Day After" and "Awakenings"
2005 Numb3rs Lt. Havercamp Episode: "Vector"
2009 The No. 1 Ladies' Detective Agency Mrs. Curtin Episode: "The Boy with an African Heart"
2014 NCIS Dr. Loretta Wade Episode 11.18/11.19: "Crescent City (Part I and II)"
2015 Archer Claudette Kane (voice) Episode: "The Kanes"
2018 The Lion Guard Kongwe (voice) Episode: "The Wisdom of Kongwe"
^ Langenhennig, Susan. "CCH Pounder of 'NCIS: New Orleans' turns a downtown condo into her personal art showcase". NOLA.com. Retrieved 20 February 2018. ^ "C. C. H. Pounder Biography (1952–)". Filmreference.com. Retrieved 30 October 2014. ^ "CCH Pounder Biography – Yahoo! Movies". Movies.yahoo.com. Retrieved 30 October 2014. ^ "Superman: The Animated Series DVD news: Announcement for Superman/Batman: Public Enemies". TVShowsonDVD.com. Archived from the original on 30 October 2014. Retrieved 30 October 2014. ^ Jalea (1 January 2003). "Unchained Memories: Readings from the Slave Narratives (2003) – IMDb". IMDb. Retrieved 30 October 2014. ^ "ANSA". Ansaafrica.org. Archived from the original on 16 December 2014. Retrieved 30 October 2014. ^ "A&U:America's AIDS Magazine". Aumag.org. Archived from the original on 25 July 2013. Retrieved 30 October 2014. ^ "CCH Pounder". IMDb. Retrieved 30 October 2014. ^ Mitovich, Matt (February 3, 2014). "Scoop: NCIS: New Orleans Pilot Adds Sons of Anarchy's CCH Pounder, JAG Alum". Tvline.com. Retrieved February 3, 2014. ^ "Batman: Arkham Origins (Video Game 2013)". IMDb. Retrieved 30 October 2014. ^ Toys for Bob. Skylanders: Trap Team. Scene: Closing credits, 8:40 in.